There are some interesting paint job's out there in the world of cars, flip, chip, flake, bare, even rust is a finish of sorts that seems popular with certain types. However the suspicion had been growing with me of late that apart from the analogy of 'spanking down the road' my ride may have more in common with the tome '50 Shades of Grey' than I might like to think. With a touch up here, a lick of paint there (in one case a complete bolt on bumper). High time to consider a respray, although even this is a bit fraught, some just having a general 'blow over' to all glass out, sand down and do it 'proper'. I decided on the latter, however it is normally at this point, if your going to go to all the trouble (and expense) of a glass out fully primed spray job, that thoughts turn to changing colour, else what would be the point of going to all the trouble (and expense) if no one knew you had done it? It is usually at this point that all the candy, flip, flake extreme colours start to sneak in. Them that know me would agree that I don't have an over active imagination when it comes to actual colour, in fact some may say I prefer the absence of colour, which apparently black is (Although I still don't understand why I had to buy the paint then?!). Authors note: I have always had a thing for black cars and (in part) blame Zaphod Beeblebrox who when seeing Hotblack Desiato's Sun Dive stunt ship commented "Its the wild colour (spelled colour as Zaphod was an Englishman.. Sorry Googles insistence on USA spelling is grinding) scheme that freaks me out, every time you try and operate these weird black controls that are labeled in black on a black background, a little black light lights up in black to let you know you've done it". Lets try to drag this post back on track.. So the car will be black then... In the absence of a colour change what else can I do to make it worth doing. Well the side skirts were annoying me a bit, even though they were original Nissan and made of fine ABS plastic, the little rubber finishing strip was.. well, finished and starting to come away. I also needed a rear bumper which as a replacement for the original rear bumper was a bit of a poor spray job. Note I melted the original back bumper on the exhaust, which I then covered with a heat shield, which got melted with the exhaust, which I then replaced... I have since had a new back box made. At this point step in SkylineSpares Essex, or Steve, a breaker of cars and purveyor of spares at reasonable cost. 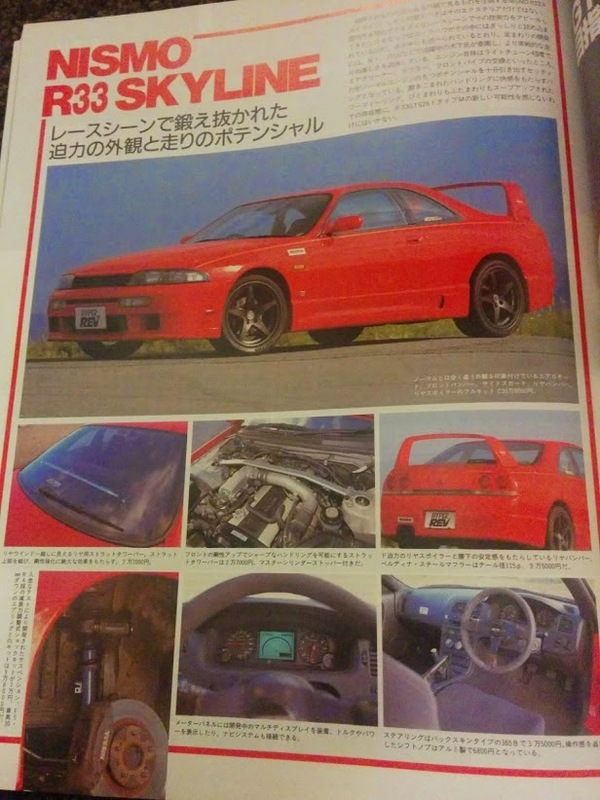 He turned up a FRP 400R style Nismo body kit for a GTST. Ghastly paint.. no not that it's silver! Just bad! Consisting of Rear Bumper, Skirts and Rear Spats. The overall condition was not perfect but is repairable and preferable to that of a aftermarket 'copy' which would never fit in a month of Sunday's! 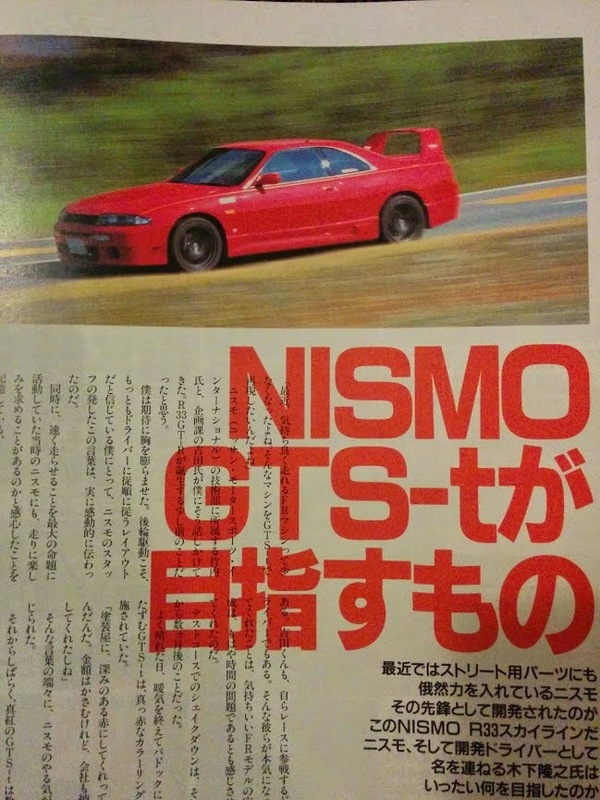 A friend of mine in Australia also came up with the following article about the NISMO GTS-t which was a brilliant find. 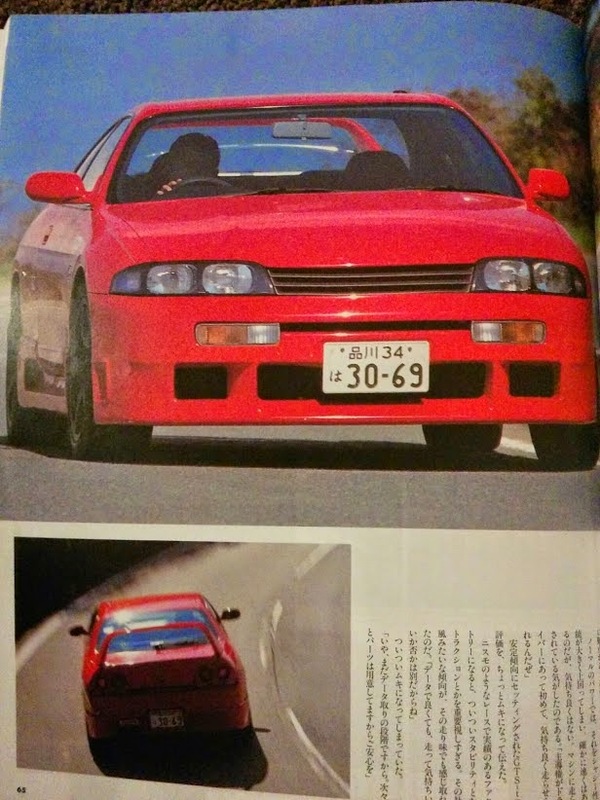 Obviously on a pre 97 spec 1 model (judging by the front lights). what is notable on this car has to be that rear spoiler! It has a real 'Supra' feel to it and probably in these enlightened times is a bit borderline ugly! One other fascinating thing about the body parts in my possession is that sanding down the layers of paint at the very bottom layer I found red! Who knows, maybe I have this very body kit! That will do for now, see the next post as we move inexorably towards paint.